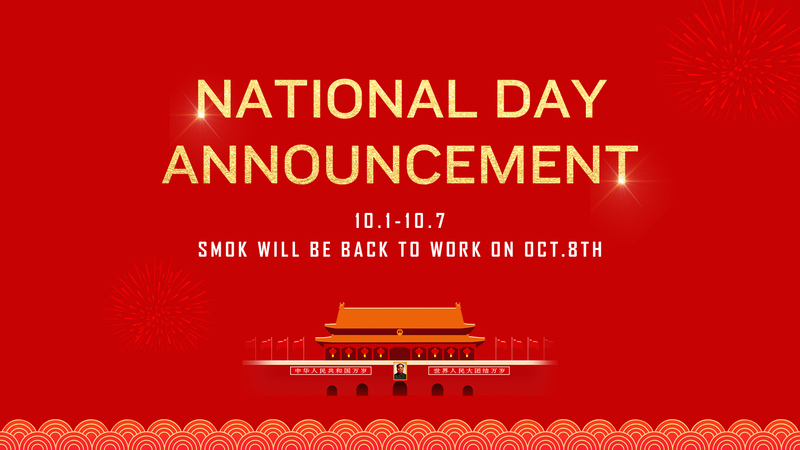 National Day Announcement - SMOK® Innovation keeps changing the vaping experience! China National Day is coming soon,SMOK will have one week to celebrate this great holiday. All orders before 29th September will be processed before 30th September. The orders from 30th September – 3th October will be processed at 4th and 5th October, 2018. The orders from 5th -7th October will be processed at 8th October,2018. Please note there will be no email response during the holiday as well.If you have any questions or problems during this period, please reaching out your local distributor to get help,also you can communicate with other users in SMOK official APP--VapingTour. We'll start to deal with all questions from 8th October, 2018. We will be back to work on 8th October 2018. Sorry for the inconvenience and we appreciate your kindly understanding.